While various garments such as tweed sports jackets or knitted tank tops are handy stopgaps for the transitional seasons, they’re ill-equipped to face harsh winters. Indeed, as cold weather creeps closer, an overcoat or topcoat becomes a necessity rather than simply a fashion accessory. Not sure which coat to wear with a suit? We’ve teamed up with the gentlemen from Bespoke Unit for some great advice. Here’s their take on the best coats to wear with suits, and when to wear them. Do you know how a coat should fit? At Bespoke Unit, we firmly believe that this is of paramount importance. Even the most affordable garments look great if they fit properly. Think of the coat as a second suit jacket over your suit. As such, you can apply the same sartorial rules when trying one. Nevertheless, remember that not everyone has off-the-rack measurements so consider alterations if you struggle to find the right size. Firstly, wear your suit when trying on coats so you can judge the fit better. The fabric of your coat should lay flat over the shoulders rather than forming dimples or hanging over. Meanwhile, the overcoat should effortlessly close around your chest and waist. If it’s too tight, you’ll see telltale signs of stretching such as an “x” shape around the buttons or wrinkling on the waist. Given that there’s a suit jacket underneath, it’s fine to have a little play but it doesn’t want to be too baggy either. 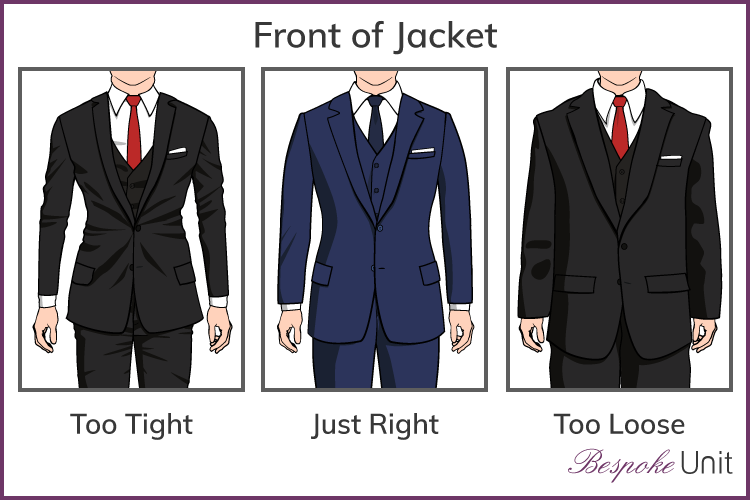 Although there’s a little leeway regarding sleeve length, try to avoid showing your jacket cuff. Nevertheless, keep it above the knuckle of your thumb so as not to appear too long. Finally, always aim for your overcoat to be slightly longer than your suit jacket. Ideally, you don’t want to see any of the jacket’s quarters or vents poking out underneath. Conversely, it’s generally believed that coats shouldn’t go below the knee. A coat can be worn whenever the weather requires it. While there are no hard and fast etiquette rules regarding when to wear one, try to reserve coats for outdoors. It’s generally thought to be good manners to remove your coat when indoors. Raincoat (210 – 312 g/m²): Traditionally made from cotton gabardine, waterproof raincoats such as the trench coat are lightweight and breathable for all seasons. Topcoat (360 – 390 g/m²): The topcoat’s mid-weight fabric ensures insulation and comfort during the late fall and early spring. Overcoat (420 – 570 g/m²): During winter, heavy overcoats will provide sufficient insulation for even the most unforgiving weather. It’s also important to consider the fabric type. We generally recommend natural materials such as wool or cotton for coats. Thanks to their natural characteristics, they usually provide superior durability, water resistance, and insulation to synthetic fabrics. Then bear in mind that material like cashmere is not only eight times warmer than sheep’s wool but also considerably lighter. Therefore, a cashmere coat will likely be less cumbersome than the woollen equivalent, yet provide equal or superior performance. Although there are many versatile coat styles, it’s difficult to find one that can be worn for all occasions. As such, it’s important to think about your needs when choosing a single coat for all eventualities. As a general rule, formality increases as the color becomes darker and the fabrics become more refined. As the yarns become coarser (such as tweed) or the colors lighter, the coat usually becomes less formal. However, both the cut and style continue to play a role in a coat’s dressiness. Likewise, coats become more casual when they feature ornamentation such as buckles and visible buttons. If you invest in a less formal coat, smarten it up when required by adding a lapel flower or pocket square. While many workplaces still insist on the more conservative business professional dress code, there’s a little more flexibility with regards to overcoats. A particularly versatile design for both business and formal attire is the covert coat. Often made from wool with relatively fine yarns, the covert coat also comes with a number of pockets for added practicality. In some cases, your overcoat presents the ideal opportunity to add a splash of color to your attire. For instance, covert coats often come in lighter colours such as camel. If opting for a trench coat, light tan is the classic favourite. Meanwhile, if you work in a smaller or more rural area, tweed is a stylish option.Tweed long coats come in a plethora of patterns and exude traditional British tailoring. While not overly formal, they’re particularly versatile and can be worn with less dressy business professional or even business casual styles. Overcoats and topcoats tend to be associated with suits. Therefore, business casual attire provides considerably more flexibility. Nevertheless, it can still be challenging to get right! A great way to overcome this is by sidestepping the overcoat entirely and opting for a more casual style. For this reason, the field jacket is an excellent choice during harsh winters thanks to its shower proof membrane and insulated lining. Given that the likes of Barbour have experienced something of a renaissance, field jackets are currently soaring in popularity. With a design reminiscent of fieldsports and game hunting, the field jacket features all the hallmarks of quintessential British style, even down to tiny details like the padded shooting shoulder patch. Meanwhile, the upturned collar and contrast lining offer a dash of contemporary flair. Now that you’ve learned about the best overcoats to wear with suits, you might be interested to read our Complete Guide To Overcoats For Men. Not sure what wear with your new coat? Check out this infographic guide – How to choose men’s shoes. This article was written by Charles-Philippe Bowles of Bespoke Unit. Their mission is simple: combine encyclopedic knowledge of classic gentleman’s style with current topical content to deliver the most comprehensive, easy-to-search, approachable men’s lifestyle resource on the web. Their aim is to help men improve their style, broaden their horizons, and live their best lives.